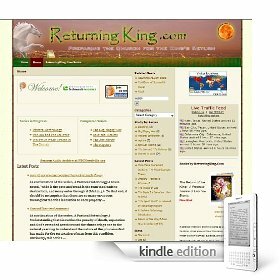 ReturningKing.com is now available to Kindle users as a subscription service. This new option for Kindle users will provide ReturningKing.com wirelessly to your Kindle device; updated regularly throughout each day so that you will never miss a new post. The price (currently $1.99 per month) set by Amazon is very affordable for free wireless Whispernet delivery while you travel and comes with a free 14-day trial. Kudos to Amazon for embracing the blog community on their outstanding e-reader devices. Subscribe to ReturningKing.com on your Kindle at this link. Of course, don’t forget that our books are also available on the Kindle platform!